Walking around any of Downtown’s neighborhoods lately, it’s hard not to spot them scattered on the sidewalks. No, the spectacle isn’t hipsters — but bright green and yellow bikes. In the last month, dockless bikes have appeared all around San Diego, with a high concentration located in Downtown, the Gaslamp District, Little Italy, and East Village areas. Two companies behind these bikes — LimeBike and ofo — both launched in the city of San Diego on Feb. 15. LimeBike, based in Silicon Valley, has been around since June 2017, while ofo, a Chinese company, was founded in 2014. Both have every similar business models — simply put, pick up a bike and pedal away. 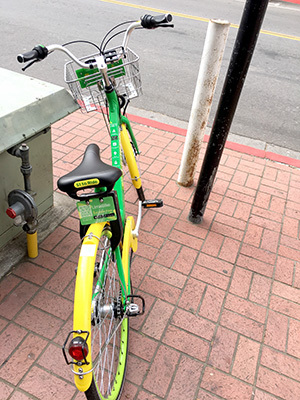 Once a resident locates a dockless bike in their immediate area, he or she scans the bike’s QR code using a Smartphone app to unlock the back tire and start their trip. The bikes can be left wherever the rider finishes their route. Bikes do not need to be dropped off at a docking station, which is a primary difference from DiscoverBikes (formerly DecoBikes), a docking bike-share system which the city has had a partnership with since 2015. This dockless model has raised a few concerns among residents, businesses and neighborhoods. Coronado started impounding the bikes using a municipal code against using the public right away. Dockless bike businesses are not fighting the city, rather building a virtual wall around the city so the bikes can no longer be ridden in the city. The Little Italy Merchants Association took it upon itself to start removing dockless bikes and asked the city to “ban” them from use until firmer regulations were in place. La Jolla and Ocean Beach also joined in the fight to regulate the bikes. Dockless bike companies are now reaching out to more community groups. Most of them say that the first few months are the most difficult to get the program situated. Once in place, they say it is a program that is good for those that utilize the service, and those that believe that it is spiraling out of control. According to LimeBike and ofo’s websites, dockless bikes are permitted on bicycle racks, curbsides away from buildings and next to bus stops. Parked bikes cannot block pedestrian paths, driveways and bus stops, and cannot be placed on street corners or left overturned on the ground. Each bike is equipped with a GPS device, allowing tracking throughout the city. Both companies have a 24-hour operations team that monitor, move and provide maintenance as needed. Though the companies encourage riders to wear protective headgear, currently helmets are not offered with each bike. Signing up for the mobile app only requires a phone number, email address and credit/debit card. No age or legal waiver is requested on the app; however, rider age requirements (age 13 for LimeBike and age 16 for ofo) are listed in online user agreements. Both companies offer safety information and tips on their websites. As for costs, 30-minute rides are $1 on both systems. However, throughout the month of March, ofo is offering free rides to all residents. 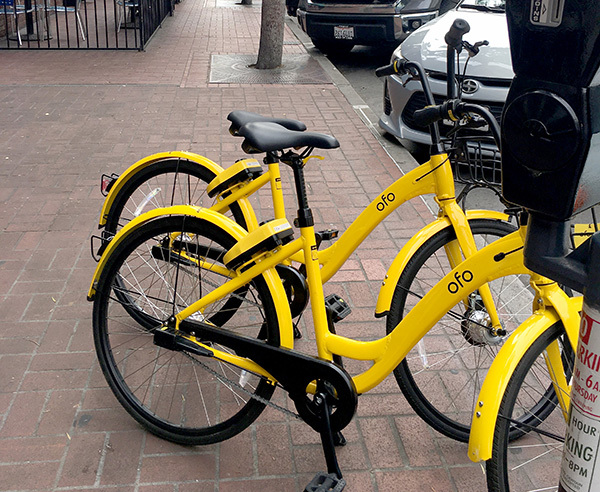 According to Anna Wan Christie, general manager of ofo San Diego, this promotion is intended to familiarize the neighborhoods with the newly launched system. LimeBike is also hoping to integrate into the San Diego’s existing transportation system by dropping batches of bikes near public transit stops. “We place bikes at locations in close proximity to transit routes, so riders can easily find and ride our bikes. Bikes often end up back in these areas due to ridership to these neighborhoods and businesses,” said Zach Bartlett, LimeBike San Diego general manager. High volumes of bikes are abundant on major streets. Kensington resident Paul Jamason — who often uses LimeBike and ofo — thinks these bikes are an inexpensive alternative to driving, as well as help mitigate theft, provide transportation equity, and offer day-to-day convenience. The ‘first-mile and last-mile’ problem refers to issues that residents may face reaching public transportation, who often have to travel a mile to and from a bus, trolley or other transit stop. Though the dockless bike phenomenon has only been present in Downtown for less than a month, Harry — who recently moved to the community from North Carolina — noted that he also saw something similar implemented on the East Coast. LimeBike and ofo are present throughout many cities, states and countries. LimeBikes are in 45 markets in the U.S. and three in Europe; ofo are in 250 cities across 21 countries. Additionally, dockless bikes have been a part of the Imperial Beach (IB) community since September 2017. IB signed a six-month trial period with LimeBike, which resulted in over 18,000 trips and more than 7,000 riders. According to Imperial Beach City Councilmember Mark West, the beach community embraced the new system of transportation. Though the initial need was to address a tourist concern, he noted that most of the current riders are residents, including middle- and high- schoolers commuting to school, as well as those who rely on public transportation. Andy Hanshaw, San Diego Bike Coalition Executive Director, pointed out that the bikes contribute to the city’s Climate Action Plan, which lists a 6 percent ridership goal by 2020. He notes that the GPS tracking system measures road-share, which will benefit future city planning for bikers. “[This program] will help determine where we need bike lanes … [the data] tells us where people are actually riding bikes and where we need safe infrastructure,” Hanshaw said. Though LimeBike and ofo both received city permits to operate, many community planning groups were not consulted prior to the roll out of the bikes. “While we were able to engage some groups in town before launching, we’re excited to continue building relationships with the community as a valuable partner in helping to reduce carbon emissions, easing traffic congestion, and promoting healthier living,” Christie said. Some of these groups not consulted are now taking action. In fact, Christopher M. Gomez, district manager of the Little Italy Association (LIA), made a motion for the City of San Diego to cease and desist all dockless bike share in the entire city. Though the LimeBikes and ofos are the most prevelant dockless bike brands in the Uptown arena, they aren’t the only two companies on the streets. Others — such as MoBike, JUMP, Spin, and Bird scooters— have also thrown their wheels into the ring. With only one month in, odds are the dockless bike craze will continue to gain momentum in the neighborhoods — and likely raise curious eyebrows of residents, business owners and tourists in the neighborhood. Some are embracing the dockless bike program such as the El Cajon Boulevard Business Improvement Association utilizing the bicycles in its Bike Share Mob event on March 31. The event aimed to promotes the use of the share bike culture and using it to promote the local business on the bike route. —Sara is the editor of San Diego Uptown News.